The journey down the M7 has yielded very few points for Skerries this season. The journey to Thomond landed this young Skerries side with a similar fate. The backdrop of Thomond Park and the occasional roar from the Munster / Stade Franacis match provided the Skerries faithful with a positive feeling, one that Skerries needed to get a result from. The warm up suggested that Skerries were in the right frame for the match. Joe Glennon was back in his familiar second row position and Paul O’Loghlen starting at scrum half and the team’s energy level looked good. Skerries finally got their hand on the ball but could not put together any serious number of phases. The first half was a stop start affair and with a number of free kicks against Skerries at the scrum for early engagement,it frustrated the players. Thomond managed the half better with kicks into the corners and applying pressure to the Skerries line. On the half-hour mark Thomond were rewarded a penalty which brought the halftime score to 17-0. The score was not surmountable but Skerries needed to kickstart the second half by running the phases and retaining the ball. (injured) and James Faiva. Unfortunately shortly after Dempsey’s introduction, he had to retire due to injury and James Faiva was re-introduced. Thomond were reduced to 14 men for a yellow card offence which gave Skerries a little advantage. After good work at the line out on the Thomond 22, Skerries forwards applied the pressure and eventually mauled their way over the Thomond line. AJ Sherlock was accredited with the try and Ciaran Frawley converted to make the score 17-7 to Thomond. Skerries needed to score again quickly to keep the momentum. Fresh legs were introduced, Eoghan Carron on for O’Loghlen, Evan Sherlock on for Matthews and John Condron on for Ronayne. Again the second half was a stop start affair which did not suit Skerries coupled with scrum penalty decisions by the referee that frustrated the Skerries team. With 20 minutes remaining, Thomond were awarded a penalty from a scrum which was converted by F McGibney to leave the score at 20-7 to Thomond. 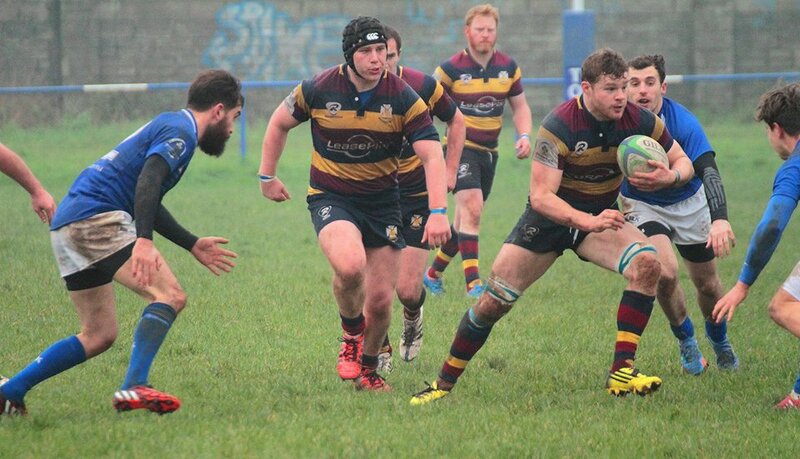 With time running out and Skerries looking to get a losing bonus point from their travels, the team tried to put some phases together but some inaccurate passing when needed most denied Skerries the opportunity to increase their points tally. With 10 minutes to go and with Skerries deep in their 22, Skerries tried to run their way out of defence , a delayed pass by was well read by the Thomond centre who intercepted and scored under the post to leave the final score at 27-7 to Thomond. The team have endured a tough number of weeks but with hard work from all and the normal great local support we can get ourselves out of this difficult situation .The team need all our support for the rest of the season . With six matches remaining, Skerries next fixture is Saturday January 30th at Holmpatrick, 2.30pm against Galway Corinthans. This home game takes on even more significance if Skerries are to maintain their position above the drop zone.